A pack with the ability to let you enjoy a hike or long climb is one that’s made in heaven. Do they exist? Well, certainly there are backpacks that take the load and tell it’s got it. This pack will hang over your shoulders and you’ll hardly feel the weight it bears. They do exist. However, you’ll have to search long and you’ll have to search hard for the right one. Why do I say that? Many manufacturers aren’t particularly honest with us when it comes to their backpack’s features. They tell you it’s waterproof but the moment it’s exposed to a mild shower, all your gear is rendered wet. So, when you see a pack that promises total comfort when filled, be wary. But here’s some good news, you no longer have to search far and wide for the perfect pack. There’s the Badlands Superday Pack, an ultra-comfortable and amazingly durable day pack. And what the manufacturers promise is exactly what they deliver. Are you still skeptical? Let’s take a closer look at the pack in this Badlands Superday Pack review. The first thing to be reckoned out is whether this Badlands pack will accommodate all our gear for a day’s hunting expedition. Let’s see; it has overall dimensions of 21 inches by 16 inches by 11 inches. Crammed into these dimensions are a total of 6 pockets in which your items will sit. The main compartment alone grants you a total of 1440 cubic inches. Add the spaces from all the other pockets, and you’ll get a total carrying capacity of 1950 cubic inches. Is this enough? You know it is. The lining inside the pockets is made to secure your supplies and protect them from damage as you walk or even run. With all this room, you’ll hardly lack space to fit in whatever you need. And having a weight of just 3 pounds and 15 ounces when empty, this pack’s overall weight will only come from what it carries. We always say that the soul of a true hunting pack, the thing that reveals its pedigree, is a built-in system for carrying your weapon. Without this, it’s just another backpack. Now, a hunting backpack can be a rifle user’s dream if it has accommodation for comfortably carrying a rifle. It could be made for archers if there’s space for carrying your bow and arrows. The badlands superday pack was built to be unbiased. This pack has an elaborate system in which whether you have a rifle, a bow and arrows or even a pistol, you’ll find somewhere to carry your weapon. At the back of the pack, there are lashing straps that secure a bow or rifle in place. Then, a drop down boot will provide a snug place for this weapon to sit in. On either side of the waist belt, there’s an inbuilt holster in which you can place your sidearm. Water is an essential component of an expedition. You’ll need to carry more than enough water to ensure you’re properly hydrated throughout the trip. The people at Badlands took this into consideration and built in the pack, just for you, a two-liter hydration reservoir. Thanks to this little feature, you won’t need to carry a separate bottle of water. Just fill up your reservoir and be on your way. And with a compatible bladder, you’ll supply yourself with enough water without having to stop. Now, here’s what eludes a lot of hunting backpacks, comfort. And the Badlands superday pack scores highly in this category. The back is made of a molded foam suspension. This suspension is ergonomically designed to flexibly take the shape of your back, matching every contour of the human form. The moment this foam meets your back, it immediately reshapes itself so that your back has a soft place to rest on. Note this; your back rests on the backpack, not the other way around. This suspension will keep the weight of the pack raised so that you maintain an upright posture thus easing the burden of carrying the load. You’ll hardly believe the pack is behind you the whole time. This is where the Superday takes the crown. The pack is made of Badland’s impressive KXO 32 camo fabric which is known to be water resistant and super silent. Then, a thread known as Hypalon has been used to reinforce high-stress areas. Hypalon is a very strong yet highly flexible material. Still, there’s more. To reinforce further the areas exposed to stress, the backpack has been bolstered with Aramid material. The fibers of Aramid are so strong that the fibers are capable of lifting 110 pounds in weight. The combination of all these makes the Superday one of the most durable hunting packs you can find. And if you had doubts about how rugged the backpack is, then doubt no more. The Badlands Superday has a total carrying capacity of 1950 cubic inches, spread out over the six pockets and compartments. With a weight of just 3 pounds 15 ounces when empty, this pack allows most of the weight to come from the gear. Built into the pack is a hydration reservoir that has a capacity of two liters. The pack can carry a rifle, bow and arrows and a pistol. The front of the pack has lashing straps which are used to secure the rifle or bow in place. On the waist belt, there’s a built-in holster which carries a side arm. At the back there’s a molded foam suspension that takes the shape of your back, providing total comfort when carrying. Having Hypalon and Aramid materials reinforcing high-stress areas, the backpack’s durability is enhanced. Made of KX0 32 camo fabric, this pack is highly impervious to scratches and is water resistant as well. Though the Superday is water resistant, it doesn’t have total waterproof capabilities. This means that if it falls in a pool of water, the contents inside will get wet. Q: Does this pack have a designated meat carrier? Q: Is the Molded foam on the back pad breathable? A: Yes, this back padding is designed to be highly breathable to improve on comfort. Q: Does this backpack have a frame? 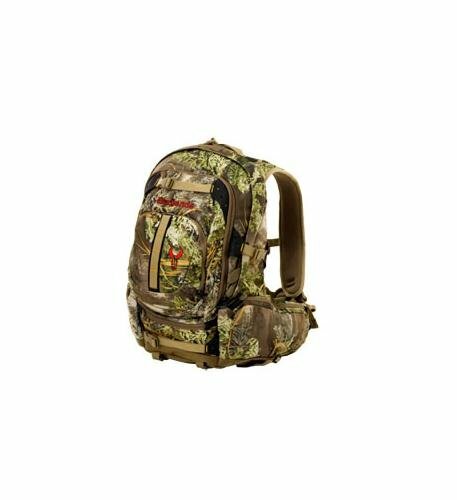 A: No, there’s no frame as it’s just a daypack meant to carry essentials for a day’s hunting trip. Q: How many years’ warranty does Badlands give? A: They have an unconditional lifetime warranty on all their products. Q: Is the material used the silent kind? A: Absolutely. KX0 32 is a very silent material, perfect for hunting. These amazing features should have converted you to a believer. Everything was done the right way. If you’re looking for functionality, the pack’s carrying capacity offers just that. If you’re looking for comfort, then the molded foam suspensions ensure you’re as comfortable as possible. And when you want your pack to remain stoic in the face of the harsh outdoors, then be sure the Badlands Superday is up to the challenge. There’s no need to search far for the perfect hunting daypack, just get yourself the Badlands Superday Pack.